On Sunday, January 24, 2016, I am organizing a snowshoe hike to Grande Pointe des Journées 1772 m. This summit, in French Chablais, offers a great view over the Geneva Lake and its basin. 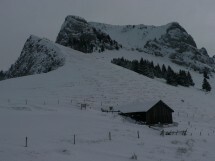 We will drive up to Jotty, on the Thonon-Morzine Road. From there we start our walk on a wide track to Chalets de Mévonne. Go up to Chalet and Col de Pertuis (between Mt Billat and Grande Pointe des Journées). Then we will continue to the Summit. Elevation gain: 1030 m. Distance: about 14 km. For experienced and sporty hikers . Equipment: Good mountain shoes, snowshoes, warm and waterproof clothes, gloves, hat, gaiters, drink. All must be prepared the day before. Rentals in Geneva. Location à Genève. http://rando-74.assoc.pagespro-orange.fr/Adhesion-Oxygene74-2016.pdf and deliver it to the organizer on Sunday morning. We meet at Gaillard, behind the customs of Moellesullaz, in front of the Librairie de France at 7h45. Inscription is obligatory. The hike is organised by the small hiking association Oxygene 74 http://assoc.pagespro-orange.fr/rando-74. There is a participation fee of 5 Euro for a daily license of the French hiking federation FFRP.